Langford’s new classroom addition is a welcoming, light-filled replacement for the old portables. Skylights flood the halls with sunlight; so much so that the lights rarely come on during the day. School and parish needs were addressed in the comprehensive Master Plan. Currenlty under construction. Awarded 4 Star Energy Efficiency Rating by Austin Energy. We worked closely with the School District officials to convert an existing training facility into a new demonstration school. The school was a prototype for a series of Early Childhood Centers planned for future construction. The library at Travis Heights Elementary School required upgrades to meet current usage standards. The summer renovation project upgraded the library’s functions, furnishings, and windows to more effectively use the limited space, as well as to improve the aesthetics. Other work at Travis Heights included new roofing, new HVAC, new flooring, and new windows throughout the school. A retaining wall was installed around the play area. Construction at Travis Heights was completed in time for the beginning of fall semester classes. 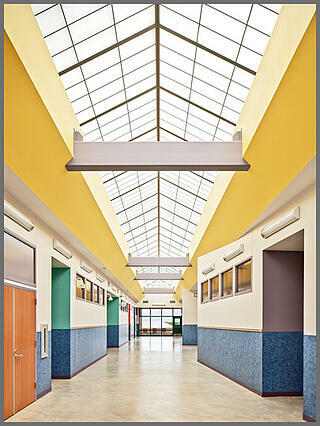 This adaptive re-use project transformed an old warehouse into Austin ISD's largest elementary school. School and parish needs were addressed in the comprehensive Master Plan. 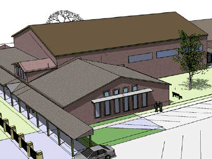 Phase I consists of a new gymnasium and Fellowship Center complete with athletic facilities for the school and a Wellness Center for the parish. A music suite is provided, and the Early Childhood Development Center is created by renovating the old Gym.